Distinctive and quite large, this one of a kind pipe is unique in that it is one of the few Missouri Meerschaum pipe styles which is entirely handmade! It features a classic dark stained cob bowl with a genuine hardwood bottom to prevent premature burn-through! It also boasts an American Birch hardwood stem and is now available with your choice of either a bent unfiltered premium vulcanized rubber bit (mouthpiece) or the popular plastic bent “Danish” bit, which for the first time allows the Freehand to accept the popular Medico filters. This is truly a classy collectible pipe and we know from experience that it makes a great gift for that hard-to-buy-for Man, Groom, and Groomsmen or for the Father of the Bride and Father of the Groom. Here's a video that I shot in 2011 after Missouri Meerschaum made the change to the Freehand pipe. In this video, I discuss aftermarket bits and the advantages of our old vulcanized rubber bit which has been replaced by an acrylic bit of the same style. Ok, lets start by saying I'm pretty new to this hobby, so I'm not the best with determining subtle nuances between pipes. I started with a pack of MM seconds, and went wild getting the Cobbit series (the Wizard is the coolest looking pipe of my collection, imho), Diplomats, Great Danes, Legends, Morgans, Country Gentleman, etc... Yes I went a bit overboard, but whatever. All smoke great, but to tell the truth, to my undeveloped palate, I didn't find much difference in smoking them except how they looked, their capacity, and how they felt in my hand. Pleased with all of them, and they are so very affordable. So, I splurge on an unfinished Freehand since it's Christmas. And wow, this is by far and away the smoothest, coolest, smoking pipe of them all. I wish I hadn't even bought all the others and just bought several Freehands. I want to smoke it all day long, it's that cool,smooth & easy to keep lit. And since I'm a newb, I sometimes tend to smoke too fast and make the other pipes get quite hot. That never happens with the Freehand. It's just the perfect pipe. 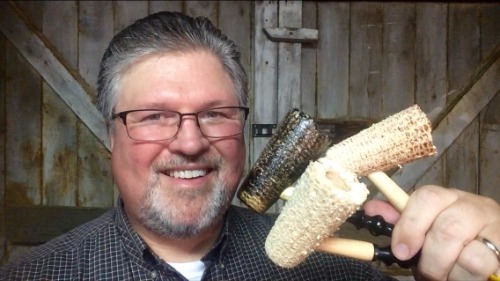 Trust me, I love all my cobs, but you just don't know what you are missing until you try the Freehand. It's the Cadillac of Cobs.